Depicted in this photo are the Ghia heater cores and housings, the Ghia wood furniture, Ghia specific rear radio (1957 converted to remote, not the same as a 1955 or ’56 limo rear radio), and our first shot of the rear A/C unit. All these items were either Ghia exclusive or modified for use by the Ghia factory. The heater cores and housings appear to be handmade and are unique as the heater fan draws through the core rather than blowing out through the core. Missing in the picture are the ducts that connect the heaters cores to the heater fans mounted in the wood furniture. The radio, which uses a 1957 Search Tune unit, has been modified to use the 1955-56 remote switches in the right arm rest. It has a large aircraft style cable with multiple pins that plug into the radio and override the knobs that were originally on the front of the unit. Ghia only rear heater fan and custom fan housing with stock Chrysler motor which is mounted in the rear arm rests. 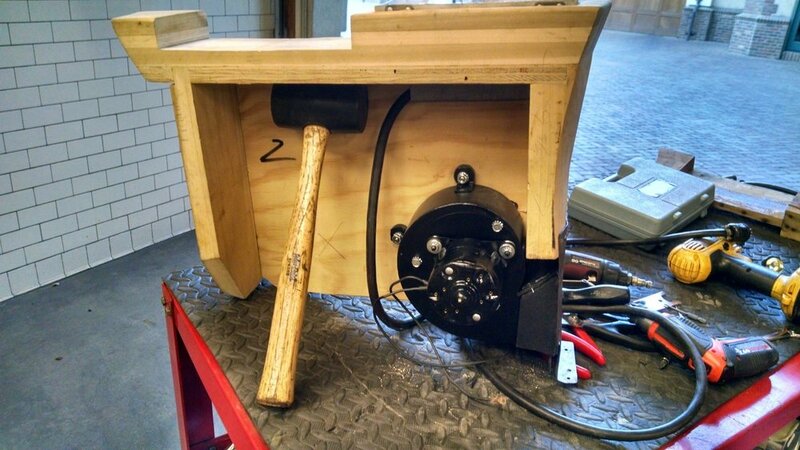 Pictured here is a mocked-up reproduction right quarter arm rest. It includes the heater fan, metal mount for heater grill, mounting cup for radio chrome cup, and radio remote control. The cutout in the rear and the height difference will be made up with foam inserts and upholstery. Notice all the curves and shaping, this was real furniture making. The highly skilled wood work extended to the jump seats, the divider and front seat frame, the wooden tack strips throughout the car, and even the frames for the front kick panels. Finished wooden arm rest showing Ghia only heater grill and hot air exit. ’55 - ’56 limousine rear heater. The left side arm rest contains 1955-56 heater/air conditioning controls. Although the hinge trim and stitching looks the same as a ‘55/’56 it is completely different and specific for the Ghia. Notice the hand stitching on the bottom of the lid. 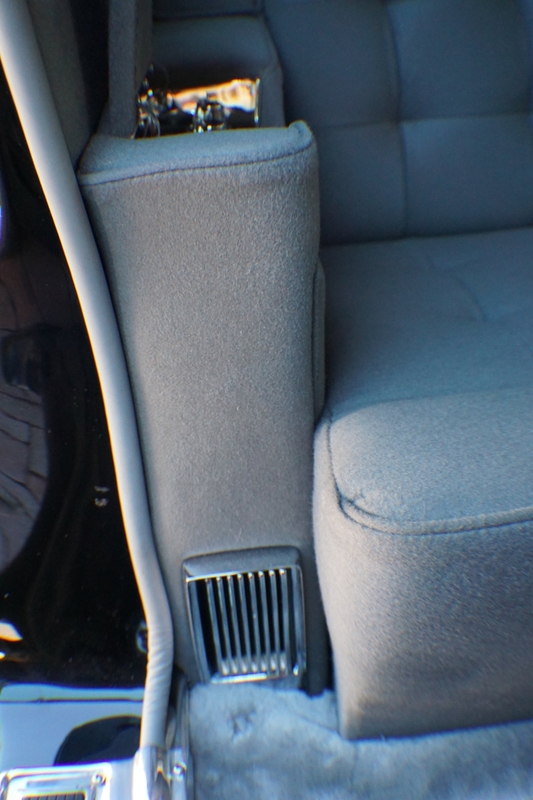 In the right arm rest is the modified ‘55/56 limo radio control. The front knob controls On/Off/Volume, and it’s lower ring controls sensitivity of the search tune circuitry. The rear knob controls tone and the plastic bar in the front lights up when the radio is turned on and when depressed changes the stations. There was no manual tuning of the radio, only electronic. The stock antenna lead had a splitter at the right front kick panel that allowed the rear radio independent operation off of a single antenna. 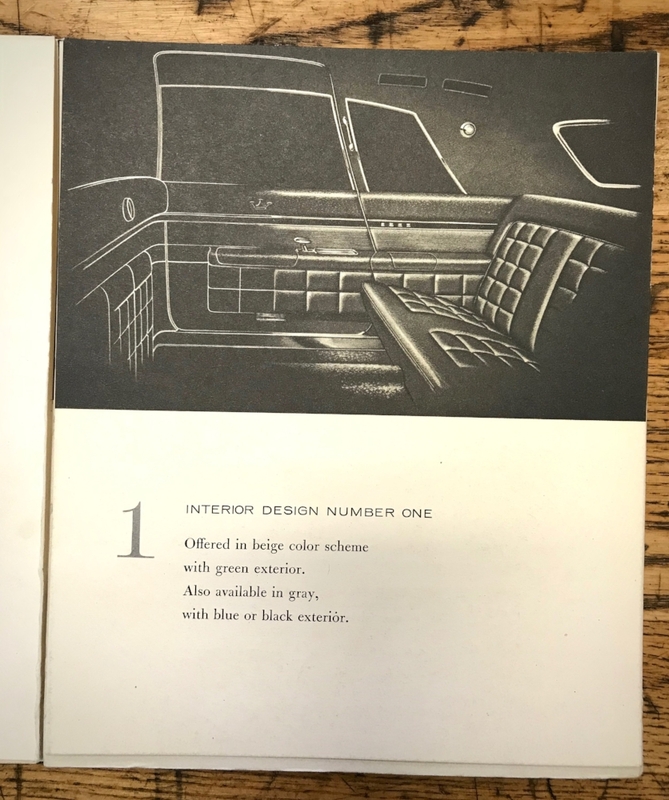 This is an example of one of five interiors available in 1958 though I’ve seen only four of them. I call them wide wood, narrow wood, no wood, and then wrap around. Only the narrow wood has the pleated interior and is the most costly and intricate to produce. We used and refined the original patterns that came from Italy and by my choice I added the embroidered crown you see in the center armrest. However, it wasn’t there from the factory on this particular interior. It does appear on other interior options. The crown thread is silk, as was from the factory, and the seat frame is a modified 1957 Imperial seat. The window switches have been modified by Ghia also. The first three operate the rear compartment’s windows and the divider glass through the previously described relay system. The rear most, fourth switch has been modified into an on/off button and operates the “eyeball” reading light. The switch is especially unique. 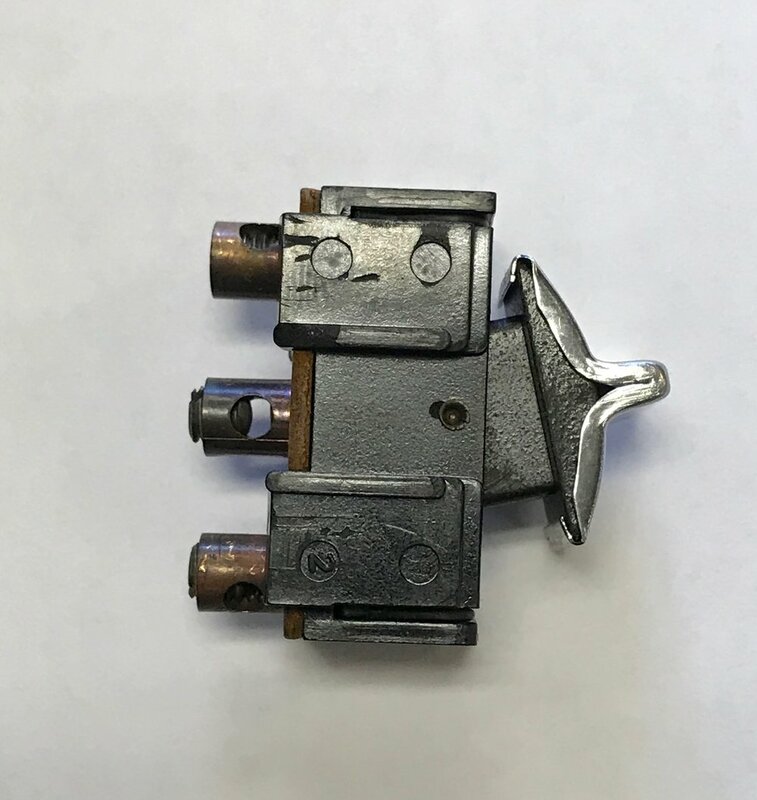 It started life as a 1957 driver’s door power window switch, on the back, threaded studs replace the original “push-on” connector. Also, the switch is wired to ground so that it supplies no power to the relays that operate the windows and the lamp. It appears that 1957 switch faces were grafted to 1956 switch backs. This is a reprint out of an original 1957 brochure. 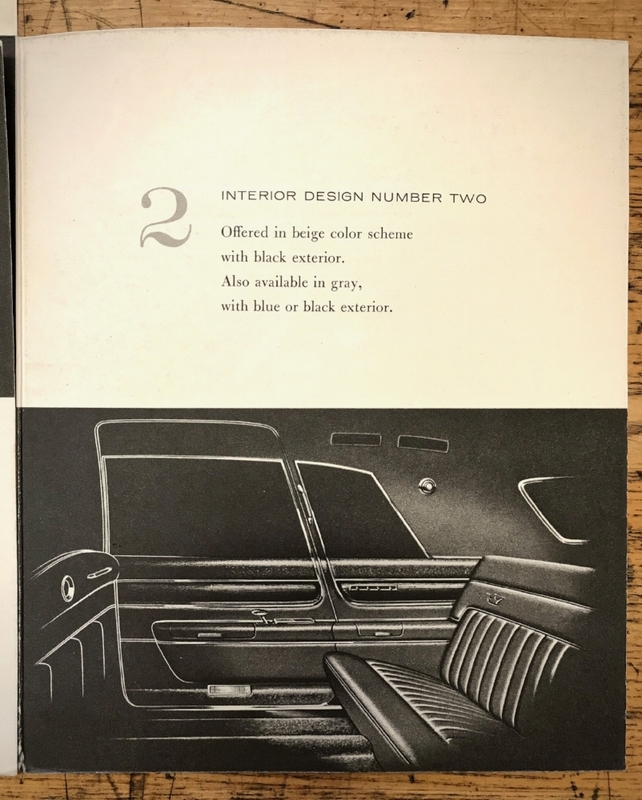 The 1958 brochure did not have interior choices in it, so we must assume the ’57 options still applied. This in an artist depiction of the “Narrow Wood” option. Note the location of the power window switches, this was never produced. 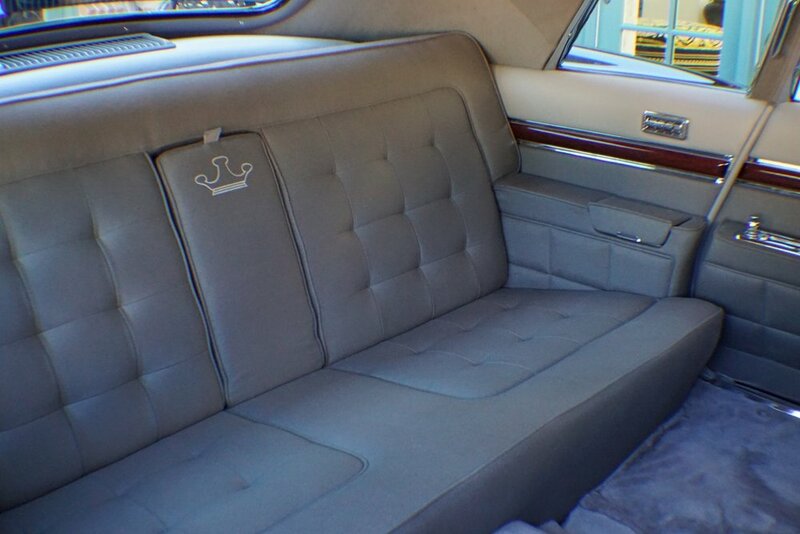 Also note the smaller and more plentiful pleats in the seat cushion. The rest of the illustration appears to be accurate to production. The metal crown shown in the upper door panel was not in my interior, however I own a 1957 which does have the crown. My upper door panels were never drilled for a crown, so whether the crown was omitted by choice or was a 1958 model difference remains a mystery. “Wide Wood”, no panels, notice embroidered crowns. 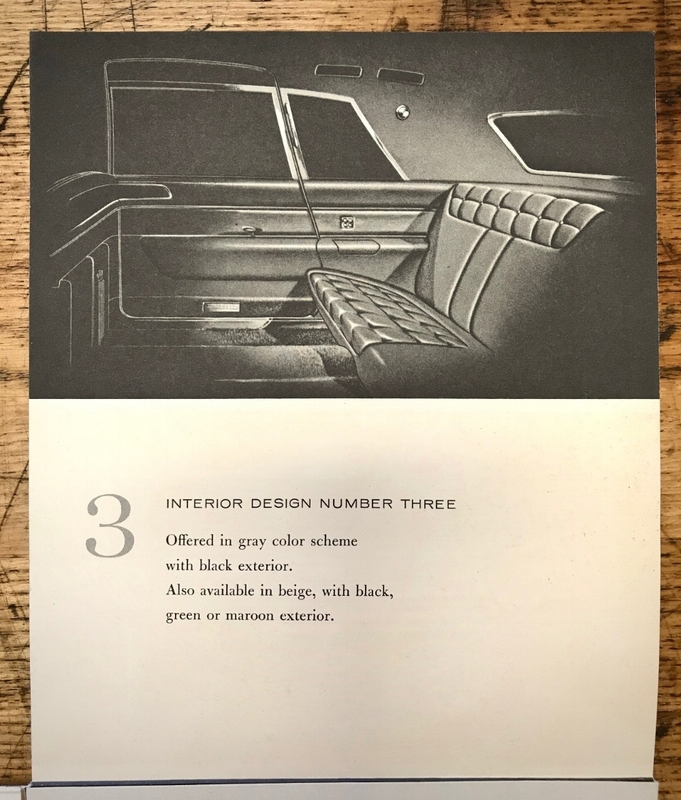 I have never seen this interior represented in any production Ghia. “No Wood”, with center embroidered crown, fun fact squarish power window switch was out of a 1955-56 limo. “Wrap Around” interior. I have one of these interiors in a 1963 with blind quarters. It’s like being in a casino booth at the Dune’s in the “Rat Pack” era.